U11 Soccer: The Under 11 Dorchester Force team includes: front row (l-r)Eric Barrios, Ideal Lobo, Oliver Culliton; middle, Soree Kaba, Clayton Rodrigues, Eben Butler, Dana Monteiro; and back row, Coach Phil Keane, Andrew Wong, Finn O’Brien, Radley Theolien, Owen Smyth, Owen Murray, Isaac Gebrewolde, Coach Dan Murray. 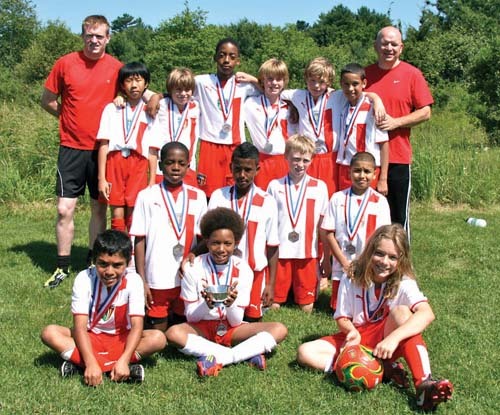 After going undefeated with an 8-0 record during the regular season, the Dorchester Youth Soccer U11 boys’ travel team won the Boston Area Youth Soccer league Division 1A last month, garnering a first place trophy. The team of 13 boys also scored the most goals, produced the most shutouts and best goal differential, and earned a spot in the June 16 Presidents Cup finals, where it earned a silver medal. Keane said he and fellow coach Dan Murray have been coaching the boys for several years now, which gives them an edge since they become used to playing together. Murray said some of the boys on the team have been coached by Keane since they started playing competitive soccer, and Keane’s impact on the players’ skill level and attitude on the field has been immense. The team practiced together a few times per week in Pope John Paul II Park in Neponset. Keane said many of the team members also play club soccer with various clubs throughout the city. Murray said the team moved up from Division 2 to Division 1 soccer just last year. According to Murray, the boys love playing together and the stronger players mentor the newer players throughout the season. “We definitely have all-stars on that team, but it definitely isn’t a group of superstars that we just picked off the shelf,” Murray said. Though the team fell to Newton in the finals of the Presidents Cup, Murray said the boys handled their loss with a lot of class and maturity. The team was highly favored to win the Presidents Cup and was ahead for the majority of the game, but things just fell apart toward the end, he said. However, the team members still told Murray they felt really lucky to be part of the tournament. Both Keane and Murray are very proud of their team’s accomplishments and look forward to competing this fall as a Division 1 U12 team.